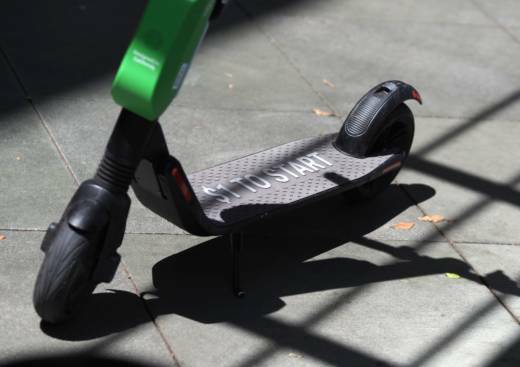 The Oakland City Council approved an ordinance Monday night that will establish regulations on electric stand-up rental scooters in the city, including making scooter firms responsible for ensuring their customers ride them safely and park them legally. The ordinance also requires the firms to distribute scooters equitably throughout the city, with half of all their machines being placed in neighborhoods based on the percentage of low-income and minority residents and households without vehicles, among other factors. “This ordinance will provide responsible guidelines for scooter companies as they do business in Oakland,” Oakland Councilwoman Rebecca Kaplan wrote in a press release. Kaplan co-authored the ordinance with Councilman Noel Gallo. “The requirements deal with a range of problems and potential problems that have occurred — including prohibiting threatening noises, requiring liability insurance, and where they can be deployed,” she wrote. Kaplan also provided a set of additional suggestions moving forward on the city's scooter permits. The ordinance also creates low-income memberships for low-income riders with a rate "equivalent to" $5 for 12 months of unlimited 30-minute rides. Several people told the City Council Monday night that the scooters were a nuisance and had been causing problems. Councilman Larry Reid, who was the sole council member to vote against the ordinance, concurred, saying "one of them almost hit me on the sidewalk." Original Post, Monday, Sept. 17: Oakland is about to join the growing number of cities around the country imposing regulations on electric stand-up rental scooters — the two-wheel transportation craze some hail as a delightful solution to traffic congestion and others condemn as an out-of-control urban nuisance. The Oakland City Council is expected to vote Monday evening to approve an ordinance that will start the process of creating formal rules for operators who have distributed hundreds of scooters — or perhaps thousands — on the city's streets. The legislation, which passed its first reading in July, is sponsored by council members Rebecca Kaplan and Noel Gallo and also covers dockless rental bicycles. It promotes rules similar in many respects to regulations still under development in San Francisco. The scooter firms operating in Oakland would be responsible for ensuring their customers ride the vehicles legally and park them properly, for instance, and they could be penalized with reductions in their fleet size or loss of their permit for failing to do so. But the ordinance also includes some requirements for the companies — Bird, Lime and Skip are currently operating there — that go well beyond what San Francisco has required so far. For example, the law would require scooter operators to distribute their machines throughout the city, with half of all their machines being placed in neighborhoods that the Metropolitan Transportation Commission defines as "communities of concern" based on percentage of low-income and minority residents and households without vehicles, among other factors. In Oakland, that's virtually the entire city below Interstate 580. "It's a significant portion of Oakland that has really been underserved historically," Kaplan said in an interview. "We want to make sure that as new options like the shared scooters come about, that everybody has a chance to benefit from that new option." The ordinance would also create low-income memberships for low-income riders with a rate "equivalent to" $5 for 12 months of unlimited 30-minute rides. That would be virtually identical to the low-income membership offered by the Ford GoBike shared-bicycle system. The law would also require companies to provide access to those who don't have smartphones or credit cards. All three of the companies currently operating in Oakland offer low-income discounts from the usual fees — $1 to unlock a scooter and 15 cents a minute to ride. Lime and Skip both offer a 50 percent discount to low-income riders; Bird waives the initial $1 fee for low-income patrons. In addition to those provisions, Kaplan is suggesting a series of other conditions be attached to the city's scooter permits. She'd like to see scooter speeds limited to 12 mph to 15 mph. She also wants the scooter firms to be required to take steps to avoid "charging wars" — the situation where people being paid to charge the machines get in battles over securing vehicles at the end of the day. Unlike San Francisco — where the city forced scooters off the streets while developing a one-year pilot project, then awarded permits to two firms that officials said filed the best applications — Oakland will not impose a limit on the number of scooter firms in the city and will allow them to continue to operate while its regulations are finalized. Processes like the one in San Francisco "have seemed to yield a lot of antagonism," Kaplan said. "Each company accuses the city of bias if they don't get to be the chosen one." She said the new ordinance will create "a fairly serious set of rules ... If the companies can follow them, they can operate, and that way the city personnel don't have to pick winners and losers."